We took a look back at the exhibition with Professor Hannah Lewi, architectural historian and key contributor to the shape and focus of the exhibition, curated by Amelia Holliday and Isabelle Toland (Aileen Sage Architects) with Michelle Tabet. The focus on Australian culture across the exhibition was supported by conversations with Olympians Shane Gould and Ian Thorpe; authors Anna Funder and Christos Tsiolkas; musician Paul Kelly; environmentalist Tim Flannery; fashion designers Romance Was Born; and art curator Hetti Perkins. Just after the team got together and were announced, I was invited to join them as historical advisor (in 2015). They had won the bid to curate the Australian Pavilion around the theme of pools and while they were doing preliminary research they found my writing on the subject and got in contact. I’ve been interested in pools for a long time. Pools are interesting public, social and architectural places of the twentieth century in Australia. We began to talk through the ways they might shape a broad range of themes around The Pool. While their focus was on curating an installation for The Pool, they also planned to produce a book and some other type of interpretative text that would form a part of the exhibition. The broadsheet format was chosen, a bit like a community newspaper someone might read at the local pool. This was conceived in a format that visitors to the exhibition could easily pick it up and take it with them. The broadsheet, From the Edge, was separate to the exhibition book, though complementary. The book is organised in a series of thematic sections. The team was always really keen to show the pool as a place of social importance in Australia, not just a site of play or organised sport, and not just a focus of architectural design. So, importantly the book and broadsheet talk about the social and political dimensions of pools as public places, and in support they worked really hard to include key popular Australian voices like Paul Kelly, Ian Thorpe and Tim Flannery to speak to different chosen themes. The exhibition book was intended to have a life after the Biennale as it includes reflective interviews with the key voices, and many examples of pools around Australia. Professor Lewi wrote sections and sourced images for the publication. Perhaps in contrast to many previous Australian biennale exhibitions, The Pool did not just speak to architects, and although there are some of Australia’s iconic pools included, it also celebrates outback and suburban pools and early Indigenous waterholes. The curators also looked at pools as places of sporting culture and Olympic competition that were important to forming an Australian self-image, which I have previously written on as well. Showing the Aboriginal connections with pools was critical to the exhibition. The book flags the role of water and natural pools in some Dreamtime stories. I was pleased that the history of the Aboriginal civil rights movement and Freedom rides was featured. This was a time when students and activists went out to rural New South Wales and protested about the exclusion and segregation of Aboriginal people from public pools. I feel that this story in particular was retold in the exhibition and book well, particularly in the imagery chosen for the book. The Lord Forrest Swimming Pool is another example of an important outback Australian pool. It was a really amazing pool in the goldfields in Kalgoorlie. When the early pipeline was built out to the goldmining town to get water out there, an early pool was built, and then in 1938 it was impressively modernised. In such a dry, dusty place it became a wildly popular public space until, sadly, it was demolished. Professor Lewi has published many articles on the architecture, culture and conservation of pools, including the book edited with David Nichols and other Faculty colleagues, ‘Community: building modern Australia’. Dr Christine Phillips has also research and written on pools that are situated at the edge of land and water with Hannah as the focus of her now complete PhD research. Despite pools being really interesting and important public places of recreation, competition and everyday living in Australia, in the last two decades many outdoor public pools have been closed down or are endangered all around the country. Professor Lewi’s focus in writing for the exhibition broadsheet was on the conservation of pools and community activism around pools. There are a number of examples where communities have come together to protect their public assets and protest about pool closures. 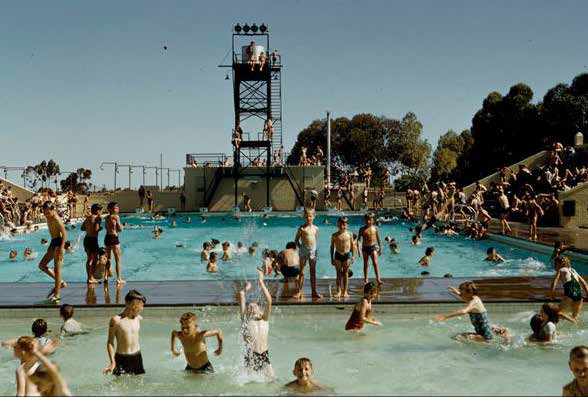 Locally, the campaign to save the Fitzroy Swimming Pool from closure is a very well-known example, and more recently, the Coburg pool campaign. I find these community campaigns fascinating because we no longer have a lot of that kind of grassroots activism here in Australia, and sometimes people unite over what may seem like unlikely places, like public pools. 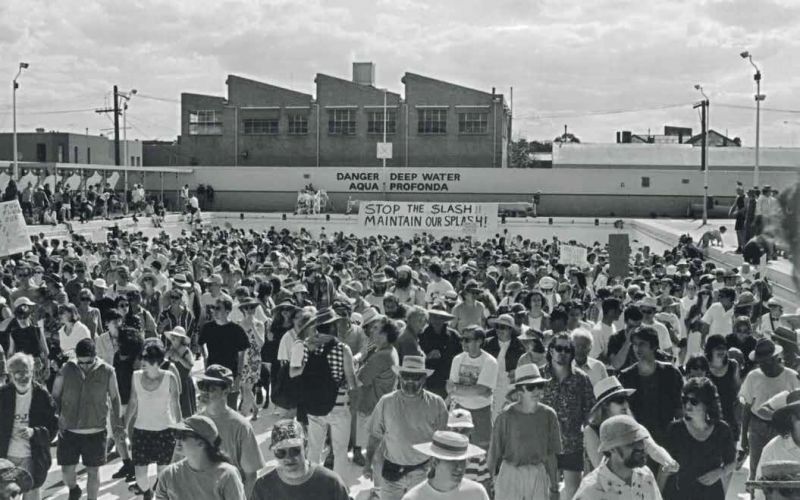 The exhibition and book has really represented this aspect of pool culture well, which is important given that many public facilities are still being threatened around Australia today. Save Our Pool Campaign in 1994, Fitzroy Swimming Pool, Fitzroy, Victoria. Photo: Andrew Lane, courtesy of Friends of the Fitzroy Swimming Pool. Sensory and collective memories that Australians hold of their local and beloved pools run deeply throughout the exhibition. The team really tried to capture the experience of remembering, with all one’s senses, the feeling of being at the pool. For example, a perfume was created for the exhibition [by perfumier Elise Pioch​and artists Lyn Balzer​ and Tony Perkins] which is designed to evoke the Australian summer spent by the pool . Christine Phillips [who now teaches at RMIT and is published in the book], also wrote in her PhD thesis about how to capture the sensory memory of pools as a way of informing architectural research and critique. I grew up in Perth by the Swan River and have sensory childhood memories of playing on the banks in the mud! These types of experiences become imprinted on you. In keeping with the exhibition’s theme of social inclusion and accessibility, the curators deliberately chose to publish the book and a broadsheet to open up the exhibition beyond Venice. These ideas of longevity and inclusion were supported by the well-known Australians that Holliday, Toland and Tabet invited to contribute to the book. At the local Biennale opening at the Fitzroy Pool, Shane Gould, for example, gave a speech that highlighted the needs of Aboriginal children living in remote communities – the benefits of public pools for these children. Broadly, the rates of Australian children who know how to swim have dropped off pretty dramatically since the heyday of the public pool. She delivered those messages very powerfully. 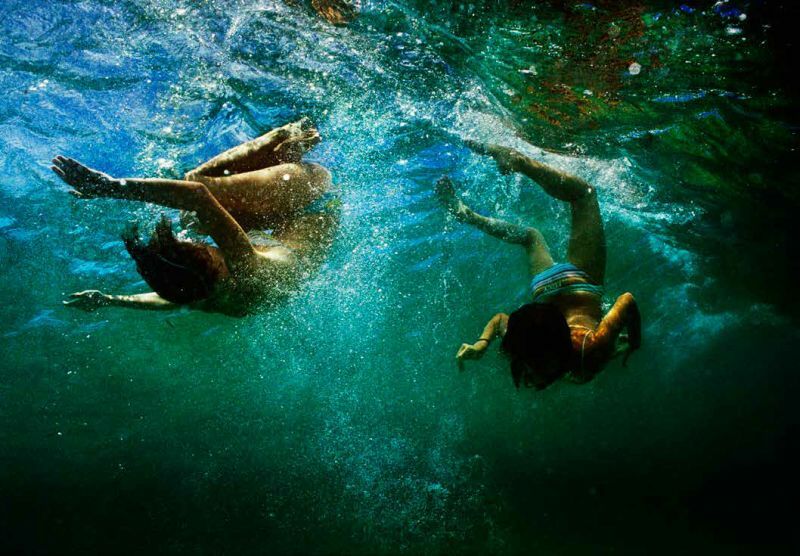 I think there is more room to look at pools as spaces where basic survival skills are taught in communities out in the open air – how to swim and how to survive around water. I am also interested in pools as, historically, places for children and families. Now that the Biennale has closed, and with it, The Pool, Professor Lewi would like to see continued access to the history of these significant sites. A guide book to the outdoor pools of Australia would be a wonderful way of marking the influence of the pool on Australian life. I’d like to see both existing and lost pools included in a guide book. There are a couple of excellent English heritage guide books to their historic swimming pools (Great Lengths, about indoor pools; and Liquid Assets, about outdoor Lidos) and really, given our context it iss surprising we don’t have a good book yet of our own.